Illiterate heart – reflections on self. 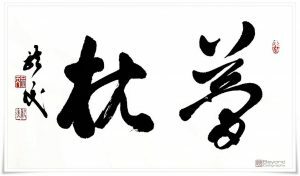 For the past few days, I have been struggling to write a review for a book entitled Chinese Calligraphy by Chen Tingyou (陳廷祐, pinyin: Chén Tíngyòu). The book itself is a great read and brilliantly depicts the beauty of calligraphy and its irresistible charm. Nevertheless, the more I tried to write, the more garbled my words became. 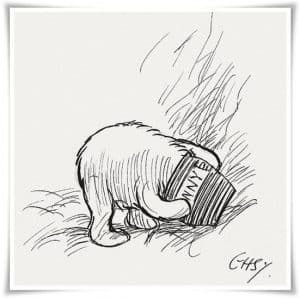 I then decided to put it aside for a few days and let my mind wander about, pondering like kind-hearted Winnie the Pooh on the meaning of life and why it is that bees have to build hives so high up in the trees while absent-mindedly strolling through Hundred Acre Wood. And then suddenly I realized that I could not write anything decent because it was not coming from my soul. Figure 1. 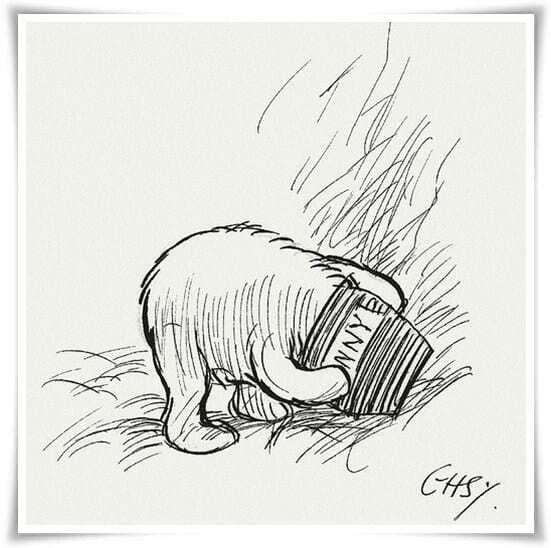 "...there was a little left at the very bottom of the jar, and he pushed his head right in..." A picture of the original drawing by E.H. Sheppard found in the book “Winnie the Pooh” by A.A. Milne. Describing another human being’s personal views, referring to the previously cited book’s author, even though you may happen to share the same passion, is not only not the easiest task for me, it nearly feels like forced labour. But this was not the only impediment to my writing a book review. From early childhood, I hated doing things in the manner of the rest of the world. Until I was 17, I didn’t even remember my own birthday. I did not attend high school parties, they bored me to death. I hated school and all the stuff it tried to jam in to clutter my head. Having uninspired teachers did not help a bit. I even remember that my Mom tried to get me to read novels by paying me, but I was never interested. Did I read them? Hell no! I skimmed through them, picked out all of the key points, and collected my money. Then I let my inner kid go mustang, stuffing my smiling gob with a chocolate triple ripple. In college, I was chosen by the University of Cambridge as one of 60 students from among all law departments in Poland to take a special British and International Law course. I quit after one year because I got bored. You can call me crazy, but for me crazy is defined by those who lead their lives the way others expect and would like them to. I believe fully that it really doesn’t matter what you do as long as you are truly connected to it and in inner harmony with it. Figure 2. 夢枕 (ゆめまくら, yume makura, i.e. 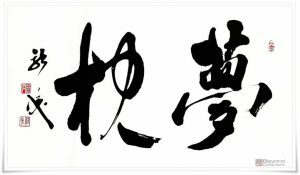 “pillow of dreams”), cursive script (草書, そうしょ, sōsho), calligraphy by Ponte Ryuurui (品天龍涙, ぽんてりゅうるい, Ponte Ryūrui). Today, while writing another etymology article, I was struck again by a simple truth. I was researching ancient forms of the character 字 and came across one that can be found in a work by the early Tang dynasty Sun Guoting (孫過庭, pinyin: Sūn Gòutíng: 646–691 C.E. ), entitled Shu Pu (書譜, pinyin: Shū Pǔ, i.e. “Treaties on Calligraphy”). I have read this work many many times, and I find it possibly one of the most inspiring texts on calligraphy ever written. So how was it possible that when I looked at the set of two hugely important Chinese characters, that I could not remember what they were. And this is when I experienced enlightenment. The characters, or names, birth dates, anniversaries, historical facts, etc., are so boringly unimportant. The energy of words and actions is what is important. It is the spirit and passion that moves us, not the reason behind it. In the psychology of the crowd, the mass follows, even though it may be against their own often unrecognized true desires, like sheep to emotional slaughter. Thus that is why my soul was rejecting all of the intellectual dirt with which I was duck-fed from the earliest days of my life. The tabula rasa is brutally erased by our parents’ socially accepted “do not stare at people, darling, it is terribly rude” brainwashing remarks. The pure kid inside us dies so that the boring Beep-o-tron Corpus can continue its numb vegetation in this ridiculous world. I would prefer to die rather than to be subdued by such rules. I do love writing poetry, but I hate reading it. I do love researching, but I hate remembering facts. Is it really so important to know the dates of the Song Dynasty (宋朝; pinyin: Sòng Cháo, 960 – 1279)? Instead, why not sit in front of a masterpiece written by Mi Fu (米黻, pinyin: Mǐ Fú, 1051–1107 C.E.) and sense the power of his character, his charisma and eccentricity flowing like black blood in his brilliant writing that crosses the boundaries of several centuries, crushing norms, opposing the canons of the mighty Tang and reaching straight to our heart. Figure 3. 夢枕 (ゆめまくら, yume makura, i.e. “pillow of dreams”), semi-cursive script (行書, ぎょうしょ, gyōsho), calligraphy by Ponte Ryuurui (品天龍涙, ぽんてりゅうるい, Ponte Ryūrui). My love for calligraphy is like the one of a child for his Mum. It cannot be reasoned, explained or scientifically dissected. It is just there, hovering above the fumes of civilisation, like a free dragon. It is true that there are many rules in calligraphy, but they all guard its purity, keeping it intact and untouchable by the passing of time. Calligraphy allows me to fully express my character and personality. It is to be chased but never caught, to be researched but never fully understood, to be intuitive and never defined. Calligraphy always manages to surprise me with its secrets, like peculiar sceneries and fantastic visions roaming my head, ever resting on the pillow of dreams. I treat my life as I treat the art of calligraphy. I let it go in the direction it wishes. Whenever it is stopped by something or someone, a bit of me dies.